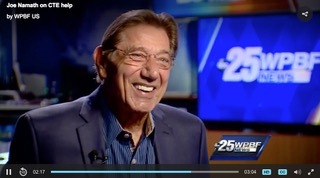 Football legend Joe Namath (number 12) says that based on what we now know about the brain damage caused by playing contact football, young people should not participate, at the least not before age 12. His concerns are not only based on current medical research, but also on his personal experience of failing cognitive function and personality changes following his football career. He understands what is at risk. His memory declined to the point that at times he couldn’t find his way home. Joe was lucky. He discovered Hyperbaric oxygen therapy (HBOT) and it turned his life around. As the conversation about when it is safe for young people to play contact sports and how it might be possible to protect them from concussions and brain damage, Namath is pushing for parents to take a very serious look at the risks versus any perceived benefits of exposing their children to brain injury. At the same time, he has become a strong advocate of HBOT as a leading treatment for injured brains, whether on the playing field or the battle field. He has teamed up with researchers at the Jupiter Medical Center in Florida to promote a major clinical trial using HBOT to treat brain injury.